Cut 24x12-inch sheet of waxed paper; place on work surface. Pop popcorn as directed on bag. Pour popcorn into at least 8-quart bowl or large roasting pan; remove any unpopped kernels. Stir in cereal, pretzels and chocolate pieces. In 1-quart saucepan, melt butter over medium heat. Stir in brown sugar and corn syrup. Heat to boiling, stirring constantly. Boil 1 minute. Pour brown sugar mixture evenly over popcorn mixture, stirring to coat well. Spray hands with cooking spray. With sprayed hands, quickly and firmly shape generous 1 cup popcorn mixture into ball. Place on waxed paper. Repeat with remaining mixture to make about 9 more balls. Cool 10 minutes. Wrap each popcorn ball in plastic wrap. 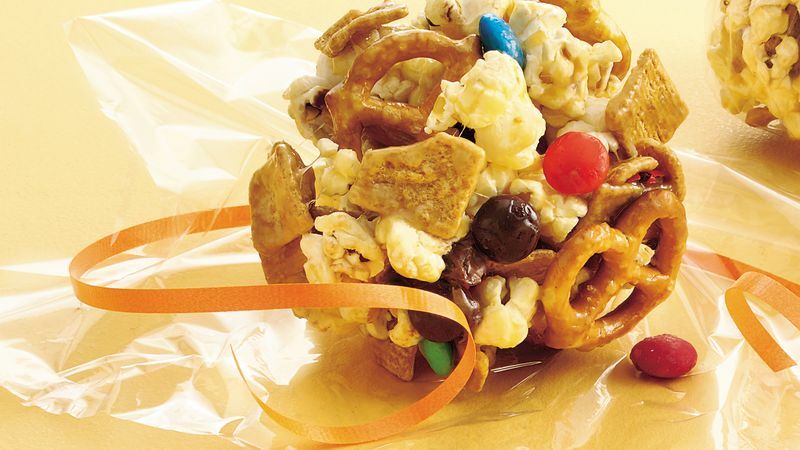 Play up the football theme by using candy-coated chocolate pieces in the colors of your hometown football team, or wrap the popcorn balls in plastic wrap tied with team-colored ribbons.